Q&A: Do Your Volunteers Wear T-Shirts? Have you considered requiring your team to wear t-shirts while serving? If not, why not? Once, we had a Summit Kids staff member who had to wear the same Summit Kids t-shirt every weekend. Sunday after Sunday, without fail, she wore the same t-shirt. Fall colors, winter colors, spring colors…it didn’t matter. Whatever color the Kids t-shirt was was what she wore. Eventually that staff member stepped away from staff, and she landed as a volunteer in our First Impressions ministry. I was talking to her one day and brought up the idea of having weekly t-shirts for volunteers, and she threatened divorce or perhaps homicide by wood chipper. Okay, that story is sort of an exaggeration. But not by much. The homicide was actually going to be by burying me in a pile of pre-worn volunteer t-shirts, but the wood chipper sounded less germy. 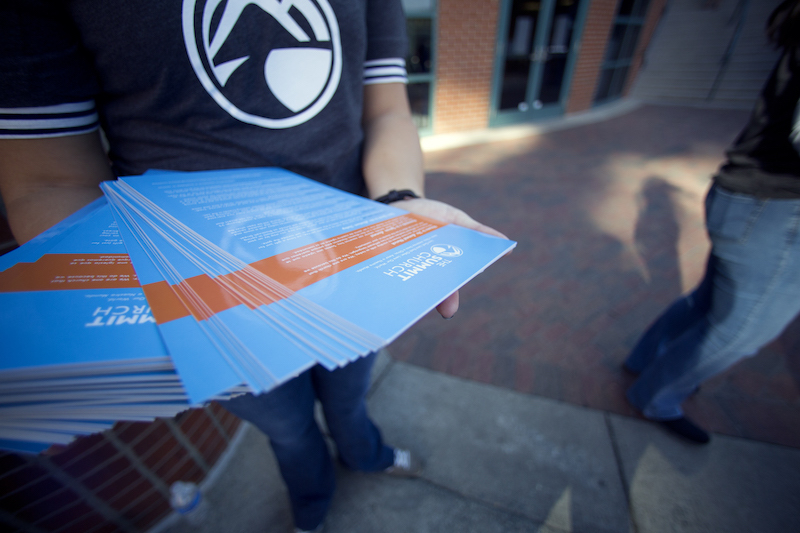 Historically, we have not required our First Impressions volunteers to wear t-shirts. T-shirts are a ministry-by-ministry and campus-by-campus decision. Some of our teams – such as Summit Kids and Production – wear them weekly. Our First Impressions teams may wear them for special all-church events like the one pictured in the header photo. We’ve had FI teams (or sub teams such as First Time Guests or Next Steps) that will wear them as a part of a campus launch so they’re easier identified. With t-shirt requirements comes t-shirt policing. I’ve found that volunteers wear them faithfully for the first few weeks, and then the shiny newness of matchy-matchy gets tiresome. If you’re going to require t-shirts, it’s only fair you cover the cost. I think it’s entirely reasonable that you allow vols to foot the bill for an extra t-shirt or an additional design. But the basic model should be on you. 2. Is it all or nothing? It’s one thing to have a parking lot vol wear a t-shirt. Are you going to have your auditorium team outfitted in them as well? The culture and implied dress code of your church will make a huge difference here. 3. Are there consequences for not wearing a shirt? North Point Ministries does this the best way I’ve seen. They feed their vols very well each weekend, but without a volunteer t-shirt, you don’t get in the volunteer lounge. No shirt, no service. 4. Is your t-shirt plan sustainable? This one is easy to overlook. Don’t just order for the number of vols you have now. Plan for the new vols that will be joining in the months to come. Buy extra so no one is left out. 5. Who speaks to the design? True story: my brother-in-law works for Apple retail, and I’ve long been jealous of his in-store dress wear. Their simple design (think one line of text on the front) is simple and eye-catching. Consider something more than just your church logo. A phrase like “We’re glad you’re here,” “How can I help you?” or “Welcome home” communicates that you’re a part of the First Impressions team. If you have a winning t-shirt design or plan, share it with me. I’d love to pass your model along!